From Shamrocks & Shenanigans – Traditions of St. Patrick’s Day! Today, St. Patrick’s Day is a transcontinental celebration of Irish culture, filled with festive food and traditions. Amidst the millions of people that don green to celebrate the Irish few know the reasoning behind many popular St. Patrick’s Day traditions. Have you ever wondered why we wear green, tell stories of leprechauns, display shamrocks and pinch our friends on St. Patrick’s Day? Read on to discover how these modern day St. Patrick’s Day shenanigans came to be. According to some accounts, blue was the first color associated with St. Patrick’s Day, but that started to change in the 17th century. Green is one of the colors in Ireland’s tri-color flag, and it has been used in the flags of several Irish revolutionary groups throughout history. Ireland is the “Emerald Isle,” so named for its lush green landscape. Green is also the color of spring, the shamrock, and the Chicago River, which the Midwestern city has dyed green on St. Patrick’s Day for the past 40-odd years. This St. Patrick’s Day, millions of people will sit down to an authentic Irish meal of corned beef and cabbage. Or so they think. In fact, only half of it is really Irish. Though cabbage has historically been a staple of the Irish diet (along with potatoes), it was traditionally eaten with Irish bacon, not corned beef. Irish immigrants in America could not afford the bacon, so they substituted it with corned beef. Forgot to wear green on St. Patty’s Day? Don’t be surprised if you get pinched. No surprise, it’s an entirely American tradition that probably started in the early 1700s. St. Patrick’s revelers thought wearing green made one invisible to leprechauns, fairy creatures who would pinch anyone they could see (anyone not wearing green). People began pinching those who didn’t wear green as a reminder that leprechauns would sneak up and pinch green-abstainers. Just what does a mythical leprechaun look like and why are they so special? A leprechaun looks like a little old man and dresses like a shoemaker with a cocked hat and leather apron. According to Irish folklore, leprechauns were cranky tricksters who you wouldn’t want to mess with. They live alone and pass the time by mending the shoes of Irish fairies. According to the legend, the fairies pay the leprechauns for their work with golden coins, which the “little people” collect in large pots–the famous “pots of gold” often associated with leprechauns. The legend says that if you catch a leprechaun, you can force him to tell you where he hid his pot of gold. Supposedly, this pot of gold is hidden at the end of a rainbow. Because you can never find the “end” of a rainbow, you can’t get the pot of gold. To get the gold, you first get to catch the little Leprechaun. The cheerful, friendly ‘Lil elf most Americans associate with St. Paddy’s Day stems from a 1959 Walt Disney film called Darby O’Gill & the Little People. The Americanized, good-natured leprechaun soon became a symbol of St. Patrick’s Day and Ireland in general. According to Irish legend, St. Patrick chose a three leaved clover or shamrock as a symbol of the church’s Holy Trinity because of its three leaflets bound by a common stalk. A shamrock is not a four leaf clover, contrary to popular belief. 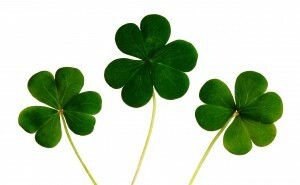 Although clovers are most often found in nature with three leaves, rare four-leaf clovers do exist. Finding one is thought to bring someone extreme luck. The folklore for four-leaf clovers differs from that of the Shamrock due to the fact that it has no religious allusions associated with it. It is believed that each leaf of a four-leaf clover represents something different: first is hope, the second is faith, the third is love, and the fourth is happiness. The good luck attached with the four leaf clover predates Christianity in Ireland back to the ancient Druid priests. You don’t have to be Irish to have some hands-on fun on this holiday, exercise your green thumb this St. Patrick’s Day & learns to grow shamrocks indoors! The popular “Kiss Me, I’m Irish,” saying is a reference to The Blarney Stone. The Blarney Stone is the “Stone of Eloquence” in Blarney Castle. Legend holds that kissing the stone brings good luck and gives you the ability to never be lost for words, becoming a smooth talker so-to-speak. If you can’t make it to Ireland to kiss the actual stone, convention says the next-best option is to kiss an Irishman. Another St. Patrick myth is the claim that he banished snakes from Ireland. It’s true no snakes exist on the island today, but they never did. Ireland, after all, is surrounded by icy ocean waters—much too cold to allow snakes to migrate from Britain or anywhere else. But since snakes often represent evil in literature, when Patrick drives the snakes out of Ireland, it is symbolically saying he drove the old, evil, pagan ways out of Ireland and brought in a new age. The snake myth was likely spread by well-meaning monks centuries after St. Patrick’s death. 1. Find a four-leaf clover. 2. Wear green (so you don’t get pinched). 3. Kiss the blarney stone. 4. Catch a Leprechaun if you can. There are many traditions associated with Saint Patrick’s Day. Regardless of your actual heritage, we all embrace our inner Irishman (or woman) on St. Patrick’s Day. Looking for more ways to have FUN this holiday? Check out these FUN games & resources!